This continues our weekly roundups of the Fall and Winter Leagues, highlighting performances from players in the Red Sox organization. Coverage will continue every Monday into January. For the full list of Red Sox prospects participating in these leagues, check out our Fall & Winter Leagues page, which will be updated continuously through January. This week's roundup covers the period of November 12 - November 18. It was the final week of the Arizona Fall League with the Championship game taking place on Saturday. The Mesa Solar Sox went 2-2 on the week and just missed the playoffs by half a game, finishing 15-14-1. Third baseman Bobby Dalbec (pictured, right) finished his up-and-down AFL with a strong week, going 4-for-11 with a double, home run, 3 runs, 3 RBI, 2 walks, and 3 strikeouts. The other two field players both struggled this week. First baseman Josh Ockimey went hitless in 11 at-bats over three games with a walk, run and RBI to go with 6 strikeouts. Second baseman Esteban Quiroz only appeared in one game, going 0-for-4 with a strikeout. The Red Sox pitchers appeared in a game apiece. Lefty Josh Taylor was the only one to struggle, allowing 4 earned runs in just an inning on 5 hits with 2 strikeouts. Lefty Darwinzon Hernandez and righty Mike Shawaryn capped off their very strong falls with scoreless appearances. Hernandez threw an inning, allowing a hit and a walk with 3 strikeouts bringing his Fall League total up to an impressive 24 strikeouts in 11 1/3 innings with only 2 earned runs. Shawaryn went 2 innings also allowing a hit and a walk with 4 strikeouts, finishing the Fall League with a 2.13 ERA and 1.18 WHIP over 12 2/3 innings. None of the Red Sox pitchers appeared in a game this week, but a couple positional players saw action. Outfielder Cole Sturgeon hit second for Margarita in 6 games this week, finishing the week 7-22 (.318). His best games were Wednesday and Saturday, going 2-for-4 with a double and a triple in each contest. Overall, he had one additional double on Sunday to go along with 3 total walks and 5 strikeouts. Outfielder Juan Hernandez also appeared in 6 games for Anzoategui but did not start in any of them. As a pinch runner or defensive replacement, he ended up only getting three at-bats, going hitless and lowering his fall line to .114/.114/.114 over 44 at-bats. The Roberto Clemente opened its season on Thursday with both Red Sox prospects suiting up for Indios de Mayaguez. Journeyman catcher Juan Centeno saw action in three games, going 2-for-11 but made one of those hits count with a home run in the first game of the doubleheader on Sunday. Shortstop Jeremy Rivera had a nice start to his winter league season, playing in two games and going 2-for-4 and 1-for-4, respectively, with a run scored in each. The Australian Baseball League also started its season on Thursday with two Red Sox prospects both playing for the Melbourne Aces. Jake Romanski is listed as a catcher but played all over the field in the team's first 4 games, logging two games in left field, one at catcher, and one as a DH. Over the 4 games, he went 5-for-14 (.357) with 2 runs, 2 RBI, a walk and a strikeout. His best game came as a catcher in game two of Saturday's doubleheader, when he went 3-for-5 with a run and an RBI. In that same game, right-hander Harrison Cooney came in to defend an 11-2 lead with a full inning in which he was able to get a strikeout before giving up a single and a double to score a run. Melbourne won all 4 of its games this week, outscoring opponents 21 to 5. 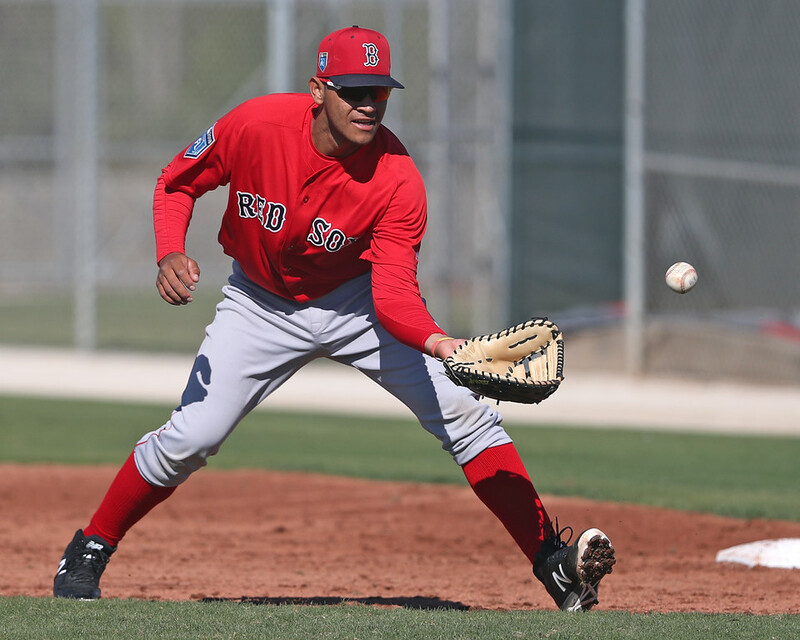 It was an uneventful week for Red Sox prospects in the Dominican Baseball League. Catcher Jhon Nunez did not appear in a game this week while outfielder Chris Madera only pinch ran on Tuesday. Boston had 5 games this week including a doubleheader on Wednesday going 3-1-1 on the week and ending the week atop the standings at 13-5-2. On Monday, Boston beat up on Aragua, winning 19-4 with every member of the starting lineup finishing with a hit. Pedro Castellanos (pictured, left), Luis Hernandez, and Gabriel Perez each had three hits. Castellanos also added a home run, 3 runs scored, 5 RBI, and a stolen base while Hernandez had 2 triples. Third baseman Carlos Tovar also filled the stat line going 1-for-4 with a home run, 4 runs scored, and 2 RBI. Beiker Pineda had the strongest performance of the pitchers, throwing 2 shutout innings allowing 2 walks and no hits while striking out 3. In the first game of Wednesday's doubleheader, the bats went quiet, with Boston only able to get three hits, with a double from catcher Andres Gari the only extra-base hit. Jose Larez gave up the only run, which was unearned, while Alvaro Leal (3IP, BB, 2 K), Luis Colmenares (2 IP, H, 3K), and Luis Rivero (2 IP, 2 K) all throwing shutout efforts in the tie. In the second game, outfielder Victor Acosta provided the offense, going 2-4 with both of the RBI. Rafael Gomez was the strongest performer out of the pen, finishing the game with a strikeout in an inning in which he did not allow a baserunner, but Boston still lost 3-2. On Thursday, it was familiar names who carried Boston to a 5-1 win. Castellanos, Tovar, and Victor Acosta, hitting 2-3-4, had 2 hits apiece and accounted for 4 of 5 runs scored and 3 of 4 RBI. Victor Garcia threw three scoreless innings while Pineda pitched well again with 2 shutout innings of his own. Garica has still yet to allow a run in his first 9 innings of the winter. Finally, on Saturday, second baseman Leonel Jimenez led the way going 2-4 with two doubles, an RBI and a run scored, while Castellanos added a double and a walk to his stats for the week. Castellanos now sports a .432/.519/.733 line over the first 44 at-bats of his winter season. All five pitchers performed well, with Yorvin Pantoja's 3 scoreless innings with 4 strikeouts and Jose Gonzalez's 2 scoreless innings with 2 strikeouts being particularly impressive and sealing up the 4-1 win. Photo Credit: Bobby Dalbec & Pedro Castellanos by Kelly O'Connor.